In this follow-up to Nesbit’s classic Five Children and It, Cyril, Robert, Anthea, Jane, and the Lamb have more magical adventures in store when a mysterious egg hatches in the nursery fireplace. Out comes a flame-colored bird, the Phoenix, who, though a bit conceited, proves very helpful indeed. The bird kindly explains that the second-hand Persian carpet recently acquired for the nursery is actually a flying one. On it, they may travel to any place and time that they wish. But once again, the children find that magic does not always go as planned. They find hidden treasure in France, and with it restore the fortunes of a little boy. Meanwhile, their own house is invaded by a thousand Persian cats, a cow, and a burglar, who eventually marries the cook on an island in the South Seas. Full of wit and wonders, The Phoenix and the Carpet is a magical ride for children of all ages. Public Domain (P)2000 Blackstone Audio, Inc. 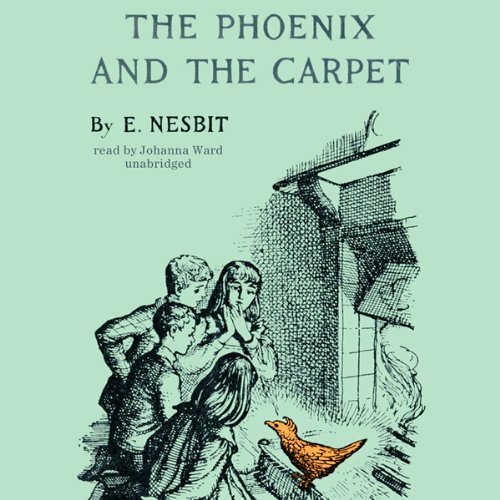 The Phoenix and the Carpet is Edith Nesbit’s sequel to Five Children and It, a collection of charming children’s stories published in 1902 which told how five siblings discovered a sand fairy which granted them a wish each day and how the children kept bungling what they wished for. In The Phoenix and the Carpet, the children accidentally set fire to their nursery (while playing with fireworks!) and a new carpet must be brought in. This, unbeknownst to their parents, is an enchanted carpet which contains the egg of a rather arrogant but good-natured phoenix. When the phoenix hatches, it teaches the children how to use the magic carpet and off they go on a series of adventures which usually have unfortunate endings but occasionally produce happy side effects. The adventures are fun and exciting, occasionally hilarious, and sometimes scary. There are a few distasteful examples of racism and classism in these stories, but I’ve come to expect that from fantasy novels written at the beginning of the twentieth century. More surprising to me is that the children are so independent — there are several times when I thought they should have asked their parents or other adults for help, or at least wanted to show their parents the wonder of the magic carpet, but they don’t. The kids say it’s because the adults won’t believe them, but the reader knows it’s because it wouldn’t serve the story if adults intervened. Edith Nesbit was an innovative children’s writer who, according to at least one biographer, invented the genre of children’s adventure literature and influenced C.S. Lewis, Michael Moorcock, J.K. Rowling, and Diana Wynne Jones. She really captures what it’s like to be a child with a vivid imagination. You get the sense that she loves children and that, in contrast to the parents of the five siblings she wrote about, spent a lot of time with them, perhaps listening to them make up their own wild stories. According to what I’ve read about her, her husband was a philanderer and she adopted some of the children he fathered and raised them along with her own kids. If you enjoyed Five Children and It, you’re almost certain to enjoy this book, too, but you don’t need to read Five Children and It first — The Phoenix and the Carpet can stand alone. I listened to the audiobook version which was read by Johanna Ward who has a beautiful English accent and is absolutely perfect in this role. If you purchase this free Kindle version of The Phoenix and the Carpet, you can get this audiobook version for only $2.99. The magic of this beautiful book !!! This book is one of my favourites and I think it's a very magical book and it makes you feel like you are there!!! I like the way you ever know what is going to happen!!! I love the book so much l read it too times!!!!!!!!!!!!!!!!!!!!!!!!!!!!!!!!!!!!!!!!!!!!! !